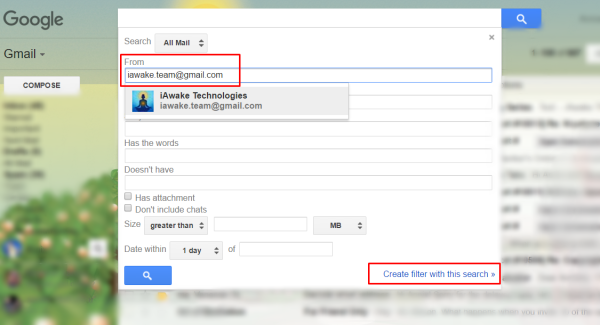 Home > FAQs > How do I change my Gmail settings to have iAwake emails go to the Primary inbox tab? 1. Add [email protected], [email protected] and [email protected] to your Gmail contact list. 2. Move your messages to the Primary inbox tab. This is the most effective way to teach Gmail to deliver future messages to the Primary inbox tab. Left-click and hold on the email to drag it from the Promotions tab over to the Primary inbox tab. Release the mouse to drop the email into the newly selected tab. Once dropped, Gmail displays a yellow box that asks if you want to make this change permanent. Click Yes to ensure that all messages will go to Primary inbox tab. 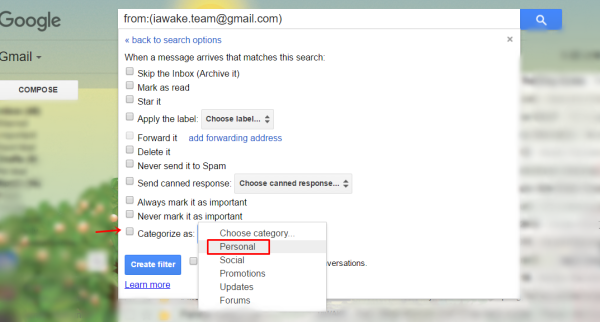 Search the email address ([email protected]) in Gmail. When the results populate, click the small grey arrow to the right of the search bar to bring up the advanced search criteria. Click the Create a filter with this search link at the bottom of the results. Once you’ve created a filter, all emails coming from iAwake will be delivered directly to your Primary inbox tab.